Aaron and I gave a 30 minute talk on Banshee to a packed room at LugRadio Live last Saturday. Media Archive did a great job of filming the talks and getting them on DVD by the end of the conference. 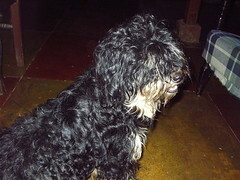 I ripped the DVD and posted the video on Google Video and as a 114MB Ogg/Theora file. I really enjoyed hanging out with Chris Toshok, Dave Camp, Erinn Clark, Sandy Armstrong, Ryan Paul, Zonker, Steve and Ian from Songbird, and tons of other cool people. Our community is full of friendly, social people. 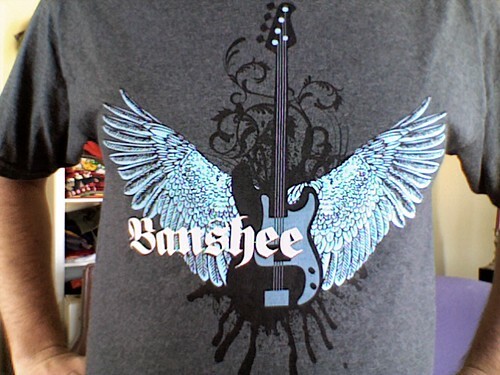 Zonker and Aaron did a great job getting hundreds of awesome Banshee shirts for us: Photo CC-BY-SA by Ian McKellar I'm hoping to make it to Penguicon in Detroit this weekend, though I think I'm getting sick, so at this point I think it's not happening. Jorge says he can give my Banshee talk for me, and hopefully we can get some shirts there. Thanks for posting your talk; I hope more will follow. I live only 50 miles from SF, but couldn't attend, since I had procrastinated on my taxes, which I insist on doing myself despite a number of factors that made them really complicated this year. That shirt it teh hotness! Are they for sale online? Man, hope you feel better and can make it to PC. Get some shirts here and we'll get some donations going. I love the shirt and picking one up at PC would rock! Very cool t-shirt, can somebody upload the logo to cafepress or something like that, so we can buy the tshirt?